In our climate we experience drastic temperature changes throughout the year which cause the ground to expand and contract. The result is settling and heaving. 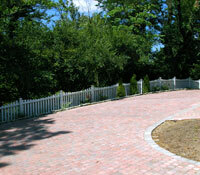 Asphalt as a driveway application has some elasticity; however it does not last very long and requires sealing. Slab and stamped concrete does not allow for movement. 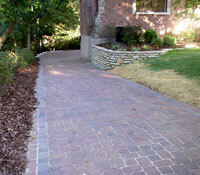 In fact, the reason you see lines cut or edged through concrete is to help control or hide cracking and breaking points. 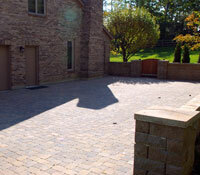 Pavers on the other hand are adaptable to expansion and contraction. Another benefit to using this type of paving surface is the ability to conveniently remove and replace damaged pavers, or for further installation of electrical conduit or downspout lines. Our manufacturer provides a lifetime residential warranty which we pass on to you. Pavers can be installed any time of year and the variety of shapes, colors and patterns provides a seemingly endless design potential.